Due to the ever-growing crowd of 100 plus Asian digerati who attend Web Wednesday's monthly social gatherings, we've outgrown our previous hosts at Lotus Restaurant and Cocktail Lounge. 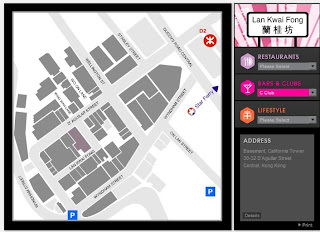 So from 7th May 2008, we will be moving our networking events to the newly launched Q97 in the basement of California Tower in the heart of Lan Kwai Fong, Hong Kong's central party area. The drinks will be on a cash bar basis at Happy Hour prices and if you download the coupon from m.webwednesday.hk to your mobile phone, you will enjoy a complimentary welcome drink when you present it at the door; Q97's staff will exchange a paper coupon for your digital one. For the moment, the Q97 website doesn't say much but, if you're curious, you can join their group on Facebook and be kept in the loop for upcoming parties. Q97 has a closed off area for those who just want to chat at the bar and a large room for those who wish to listen to the speaker. Hopefully, this means that I can spend less time finding creative (and polite ways) to tell people to "pipe down".